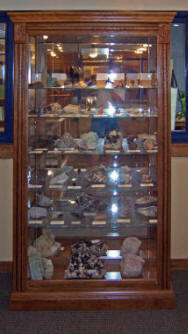 The Pikes Peak region is well-known by gem and mineral collectors for its exceptional mineral and fossil treasures. Clusters of blue-green amazonite and smoky quartz crystals, found in cavities within the Precambrian (1 billion year-old) Pikes Peak Granite, are considered the finest in the world. They can be found in many mineral museums worldwide. The Pikes Peak Granite also yields excellent crystals of topaz, fluorite, goethite, and other minerals too numerous to mention. The Cripple Creek-Victor mining district, producing from an unusual Oligocene (30 million year -old) volcanic-intrusive rock called “phonolite”, is one of the most important gold and silver districts in the United States. Exquisitely detailed plant and insect fossils occur in lake beds within the Eocene (34 million year-old) Florissant Formation. These fossils represent a time in Earth’s history much warmer than today’s climate. 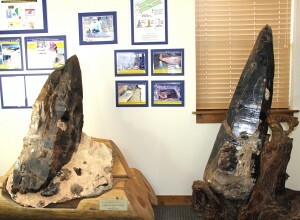 The museum at Florissant is located on the outcrop of this formation, and nearby Florissant Fossil Beds National Monument was established to showcase these local fossil treasures. The Lake George Gem and Mineral Club partnered with the Pikes Peak Historical Society, with the goal of educating the public regarding the rich mineral endowment of the area. Miners and other interested individuals were challenged to donate some of their finest specimens to the museum. In a single day, December 5, 2005, a first-class collection was born. It has expanded significantly since then. Today the collection includes two truly remarkable “twin” crystals of smoky quartz, which are thought to be the largest intact, well-formed smoky quartz crystals ever discovered in North America. 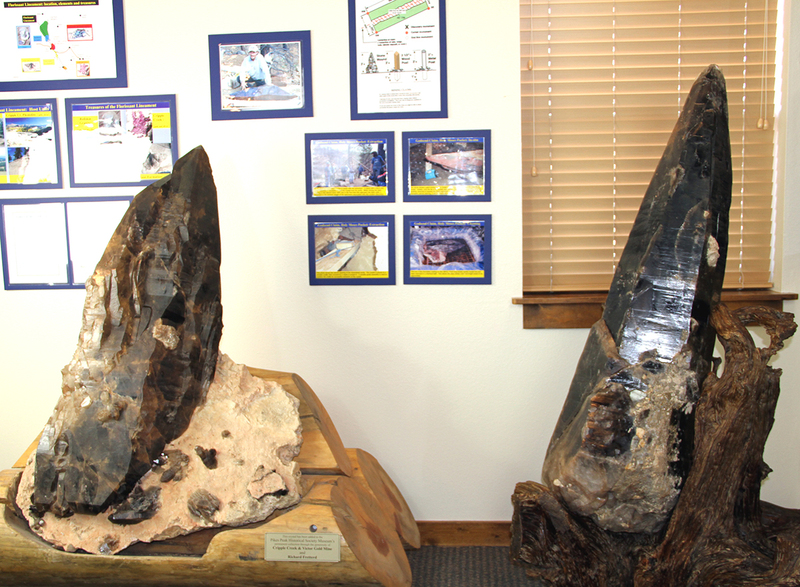 One behemoth weighs 439 pounds and stands 4 feet tall. Its skinnier “twin brother” weighs 345 pounds and is 4 feet, 3 inches long. The “geology wall” at the museum offers a unifying explanation, termed the “Florissant Lineament” hypothesis, linking the genesis of many of the mineral and fossil treasures on exhibit. A lineament is a linear feature of regional extent expressed in the topography, influenced by the underlying geology. When several discrete geologic elements occur in a straight line over tens of miles in length, a major fault should be suspected. Big fault trends are usually really swarms of complexly interconnected parallel lesser faults, reacting to periodic regional stresses due to plate tectonic motion. These faults are often re-activated over considerable geologic time. It is postulated a deep crustal tear exercised control over the rise of mineral-rich magma, forming four Precambrian, mostly circular intrusive features north of Florissant, which are likely the exposed roots of a now-eroded billion-year-old volcanic chain. South of there, the fossil-rich Florissant valley, which is filled by the relatively young Florissant formation, is likely preserved from erosion in a down-dropped fault block, called a graben. Farther south, the Cripple Creek mining district is also roughly aligned with the same linear system. Together, the above geologic elements of the Florissant Lineament are responsible for the exceptional fossil and mineral treasures found in Pikes Peak backcountry.